18 SHANGELA: THE QUEEN WITH HEART Rupaul’s Drag Race All-Star, Shangela spills the tea about All-Stars season 3, how Shangela came to be and future projects. 08 MODELS OF HOPE 2018 It’s time to learn about this year’s honorees of the award that’s making a difference in the community. 14 TAYLOR BARRETT The writer, director, and producer talks about her new project Work in Progress. 16 LILA STAR The First Trans Latina Rapper shares her inspirations, her love of fashion and what music means to her. 22 ALBUQUERQUE’S LGBTQ BUSINESS COMMUNITY Albuquerque has a small, but thriving and growing, LGBTQ business community. Learn more about them. Whether in a showgirl outfit or a gown and heels, Shangela is taking her hallelus to the bank. PRIDE & Equality celebrates another year of Models of Hope. Celebrating its 12th year, The Vincent R. Johnson Models of Hope Awards honors individuals and organizations making a difference and can be seen as role models in the community. Models of Hope has created a roster of quality honorees over the past eleven years and this yearâ&#x20AC;&#x2122;s nominees are no exception. Take a look at who we will be honoring on September 14th. 90s, I began to come out to some of my friends, but I was completely ashamed of my identity, and thought that I could change myself through religious devotion and prayer. I continued in this tormented state through graduate school and into my first job as a church musician. Finally, I decided to act on my homosexual feelings and began to date and meet other LGBTQ people at the bars. I eventually met my partner of 17 years, Daniel Maynard back in 2001. When my church found out about my decisions, they asked me to resign. Because of the NMGMC, and the people I have met as the Artistic Director, I have learned to accept and love myself as a gay man. Although I sometimes wish I could have been out when I was younger, I realize that my journey towards self-acceptance needed to be a little longer than others, and that I needed to navigate the societal pressures and stigmas of the 80s and 90s before I was ready to be honestly and publicly who I am. LGBTQ youth and attended meetings and spoke to whoever needed education or information on LGBTQ issues. I have been advocating for for Transgender inclusion for about 20 years. a good friend/best friend and person who was like me in 8th grade and we outed each other by checking out a guy, I basicly hid myself from who i was from 4th grade to after high school. Transgender Resource Center of New Mexico How did you get involved with the LGBTQ community? I’ve always been someone who wanted to help people, and I was provided an opportunity to start helping some of my communities through work founding and running the Transgender Resource Center of New Mexico. I have always been part of the LGBTQ community and the folks who have loved me and cared about me the most are part of those communities as well and I can’t think of any other place I would rather spend my time or energy then trying to give back to the communities where I was helped the most as a young person. grew, and we expect this list to grow even more. Why? Because for these small businesses, it is another “coming out” process. But the list is growing as more LGBTQ business owners see the benefit of being on the list and know it’s safe. The LGBTQ Chamber is part of the Western Business Alliance composed of the LGBTQ chambers from cities across the West. Annually, the WBA holds an Economic Summit. In 2018, it was in San Francisco. Our Chamber bid on hosting the Summit, and won for 2020. This will bring a very diverse group of LGBTQ business leaders to our City, and they, in turn, will go home and spread information about Albuquerque to their communities. The Chamber is already working with VisitABQ, hotels and business owners to sponsor the Summit, and is also working to bring many more LGBTQ conferences to Albuquerque, such as the national LGBTQ realtors association and the National Lesbian and Gay Journalists Association. All of this will help our LGBTQ businesses to grow and prosper. The Chamber works with the Small Business Administration and local funders to help members of our community to start new businesses. Mayor Keller is focusing on growing “home-grown” businesses so this is a great time to start a small business. For more info, visit the LGBTQ Chamber at www.abqgaychamber.org or email abqgaychamber@gmail.com. NM Pride Guide at www.gogaynewmexico.com. Equality New Mexico at www.eqnm.org. Be Honest: Does the US Really Value Education? that No Child Left Behind law. We know that, yes, throwing money at education will actually go a long way to solving our problems. How about just 1/10th of what we can’t account for of military spending? But we’ll also have to start thinking about teachers as a national resource. We’ll have to think of our schools and colleges as more than training institutions for some corporate agenda. In Taiwan where education is highly successful, September 28th is not only Confucius’ Birthday. It’s a national holiday to honor teachers. People there actually stop working to honor teachers. In the US we just tripped over Teacher Appreciation Week, but I bet most didn’t even know when. That illustrates our real problem. P&E Robert N. Minor, Ph.D., Professor Emeritus of Religious Studies at the University of Kansas, is author of When Religion Is an Addiction; Scared Straight: Why It’s So Hard to Accept Gay People and Why It’s So Hard to Be Human; and Gay & Healthy in a Sick Society. Contact him at www.FairnessProject.org. he Life and Death of ACT UP/LA explores the history of the AIDS Coalition to Unleash Power, Los Angeles, part of the militant anti-AIDS movement of the 1980s and 1990s. ACT UP/LA battled government, medical, and institutional neglect of the AIDS epidemic, engaging in multi-targeted protest in Los Angeles and nationally. The book shows how appealing the direct action anti-AIDS activism was for people across the United States; as well as arguing the need to understand how the politics of place affect organizing, and how the particular features of the Los Angeles cityscape shaped possibilities for activists. A feminist lens is used, seeing social inequalities as mutually reinforcing and interdependent, to examine the interaction of activists and the outcomes of their actions. Their struggle against AIDS and homophobia, and to have a voice in their healthcare, presaged the progressive, multi-issue, anti-corporate, confrontational organizing of the late twentieth century, and deserves to be part of that history. he band, Hella Bella, is unique in T their own right. With a drag queen lead singer, Bella Gigante, taking the lead of this ultimate party band, you will not be disappointed when you take in one of their shows. HOW DID THIS BAND BECOME A REALITY? Bella Gigante: My goal was to always have a band. Along the road, I began to meet different musicians who wanted to be a part and shared similar visions. Three years later it finally happened”Hella Bella was born. WHO ARE YOUR MUSICAL INFLUENCES?/ WHERE DOES THE INSPIRATION FOR YOUR MUSIC COME FROM? B: Our musical influences vary from Blonde to Rocky Horror Picture show. We are attracted the most by music that people can connect with. We love to make you dance, laugh and feel. We are inspired the most by the people in the crowd. WHAT DO YOU FEEL YOU ARE OFFERING THE MUSIC SCENE THAT ISN’T BEEN SEEN NOW? B: There is nothing greater for us than to take the entire crowd with us on our journey. There are many amazing bands out there today what sets us apart is that our lead singer is a giant drag queen with a set of pipes and a band full of wonderful characters. In addition, our band has Sarah Meadows on bass, Linda Strauss on cello, Joe Buffalo on lead guitar and our newest member Clark Libby on drums. I love this band and am very proud of them. WHAT ARE YOUR UPCOMING GIGS? 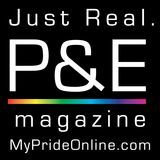 B: You can check us out at Santa Fe pride on the plaza June 30th. For all other gigs please follow us on Facebook, Hella Bella or Bella Gigante. ur queer community is filled with more than just LGBT. We are super diverse. There is no “one way” to be queer. There is no rulebook. Queer people of color and gender variant people’s do not have to fit in the toxic white patriarchal heteronormative structure of society that is pervasive in the QUEER community. PRIDE is a civil rights movement that is not just one weekend a year. It is constant community building. AIDS Education, feeding and sheltering our at-risk LGBT, political activism and so much more! The parade is fun and the club scenes afterward are LIT. But that’s just the celebration! Us queers are celebrating another year of work and another year of surviving in a world that wants to ELIMINATE US! No matter how you celebrate PRIDE please do it responsibly, plan ahead, do not drive drunk and use sexual protection! HAPPY PRIDE! CELEBRATE! ....and that is the FINAL WORD!